Awesome review on a neat little tool. Leatherman actually makes quite a few great multitools. I think too many “knife people” overlook how useful something like this simple device can be. Most places where a knife could be considered inappropriate are welcome ground for a multitool. After all, it’s just a took kit right? My last job strictly prohibited so much as bringing a knife into the building, but my Wave (or whatever other multitool I chose on a given day) was perfectly fine. I’d love to see more reviews on tools like this when you have the time or opportunity. Thank you very much, Justin! I agree that in the right application a multi-tool can be excellent. I have a rental property, and find that a full size multi-tool is great to have when fixing it up after the tenants leave. I always bring a tool kit when I do that, but you never know when you need a pair of pliers, or an extra driver, or a file or something. It adds great redundancy in that situation. If you can carry one at work, then I think you can add a lot of functionality to your carry. And you make a great point about it being more socially appropriate in some situations. No one looks at a multi-tool and thinks it is a weapon. I can see how you could get away with carrying it where a full size pocket knife would not be appropriate. I have collected a few multi-tools over the years and will plan on penning a few more reviews. It’s outside my wheelhouse, but I am always impressed by the quality and value for money Leatherman provides. Plus they are just cool. So yes, I’ll definitely write some more in the future. I come from a time when there were no Leatherman type tools. Unless you carried a tool box in the car, your choice was limited to a Victorinox knife/tool. In those days, my mentor, Ron Hood, recommended a folder that had a saw blade. I thought that having a pair of scissors was better. The compromise was the Huntsman model which had both. Fast forward, the Wave became the tool to carry in the car. However, it is too much to regularly carry, just as you observed. Now, with the increased selections available, I will need to acquire a Micra! It is one thing to have a large tool when undertaking a major construction project. It is another situation to have a small multi-tool in your pocket as one walks around and observes something that needs a quick tightening or to be trimmed. Thank you very much for taking the time out to leave a comment. They say that the best ___ is the one that you have on your person. Whether that is a gun, pocket knife, camera, or anything else. I think that definitely holds true for multi-tools as well. As you point out, while a full size multi-tool is a great piece of gear, unless you can get away with a belt sheath odds or a fanny pack or somethings, odds are slim that you will actually carry it. A tool like the Micra can get a lot done in a pinch. Certainly more than not carrying any multi-tool at all. I have two keychains; one is just my car key, but the other is keys, a Griffin pocket tool, and a Style PS. And that Style is something I use on a pretty regular basis, mostly for the pliers. It’s so nice to be able to enhance one’s grip with something so small, and the other tools on it are nice as well. 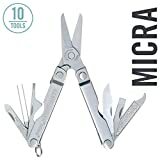 Small multi-tools like the Micra, Style family, PS4, Gerber Dime, and the SAKs are great tools to have for a lot of tasks without resorting to specialized tools and/or a full-sized MT. Great review Dan. I’ve been wanting to grab a Micra to keep in my bag for use as full-sized scissors. And I’d rather have the Micra for that than a Style CS for the tool variety, especially since it won’t be on my keychain. Thank you very much. The Style, and Gerber Dime interest me as well. I agree that they pack a lot of utility, but aren’t so bulky that you can’t practically carry them. I think I am going to venture further into the world of multi-tools. Seems like I am getting some good feedback on the review. I appreciate the support. I’m not sure if they still make it, but at one time Leatherman did make a larger tool that included a pocket clip. It was about the size of the old PST, maybe about as big as a larger folding knife. Might be a be a good option for someone who needs or wants a larger multitool with more gadgets, but doesn’t want to wear it on a belt. I believe the Wingman has a pocket clip. I have one on order and look forward to checking it out. I am curious to see how a tool like that carries with a pocket clip. Expect a review in the next few months. If I wanted to carry a bigger MT with a great but minimal set of tools and have a pocket clip, I’d grab a Skeletool, and I’d probably get the Skeletool CX for the upgraded blade steel.